No other book provides such an extensive or comprehensive set of program examples to aid instructors in teaching DSP in a laboratory using audio frequency signals—making this an ideal text for DSP courses at the senior undergraduate and postgraduate levels. It also serves as a valuable resource for researchers, DSP developers, business managers, and technology solution providers who are looking for an overview and examples of DSP algorithms implemented using the TMS320C6713 and TMS320C6416 DSK. The late Rulph Chassaing, PhD, taught Real-Time DSP at Worcester Polytechnic Institute. 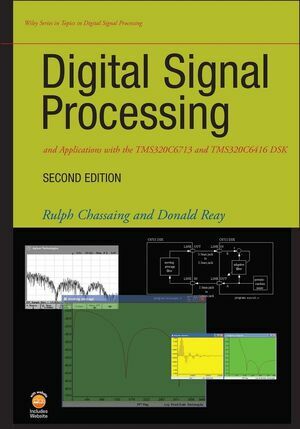 In addition to offering many DSP training workshops and seminars, he authored four other books: DSP Applications Using C and the TMS320C6x DSK; Digital Signal Processing: Laboratory Experiments Using C and the TMS320C31 DSK; Digital Signal Processing with C and the TMS320C30; and Digital Signal Processing with C and the TMS320C25, all published by Wiley. Donald Reay, PhD, is a Lecturer in the School of Engineering and Physical Sciences at Heriot-Watt University in Edinburgh, Scotland.